A food hub is in the works for the west side of Louisville, Kentucky, but it's no ordinary food hub. Organizers also envision an onsite power plant, consisting of an anaerobic digester that would turn waste into methane gas. The West Louisville Food Hub is a project of Seed Capital Kentucky, a nonprofit focused on bolstering the regional food and agricultural economy in the state. The project is still in the fundraising phase. Targeted completion date is early 2016, says project director Caroline Heine. The planned anaerobic digester will be built by Nature's Methane, a Star Distributed Energy company. Organizers estimate the city will save $18 to $20 per ton using the digester as opposed to dumping organic waste at a landfill. In addition to powering the food hub, there would be enough excess electricity to sell to the grid, potentially powering hundreds of homes. In September 2014, Seed Capital Kentucky purchased 24 acres of vacant space in the heart of the city's food desert. "We want to transform West Louisville, now a dead zone, a concrete abyss, into a living, dynamic, job-creating, community gathering space," says Heine. Heine hopes ground is broken on the digester between April and June, with operations starting by the end of 2015. 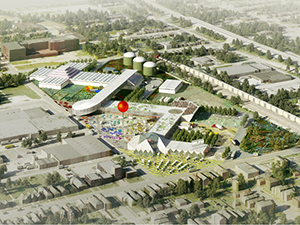 On December 17, 2014, Heine and her team got a first look at the food hub's master plan concept. Now, Seed Capital Kentucky is engaged in a capital campaign to raise money, as well as securing permitting, titles, zoning, etc. Since the food hub is a nonprofit project, money is being procured from a variety of capital sources, including federal grant dollars and tax credits. Heine's long-term vision for the food hub is a multifaceted one, centered on building infrastructure for local and regional-sourced food for Louisville. "It will be more than a food hub," she says. "More like a food park." The goal, she says, is to engage the entire community to support local farmers, small business, and create jobs. She sees the up-and-running food hub filled with food trucks, a farmers' market, an edible community garden and a demonstration farm run by Jefferson County University of Kentucky Extension. In 2012, Seed Capital Kentucky researched local food needs in Jefferson County. "We found significant unmet demand in Louisville," Heine says. Major opportunities exist in connecting local food and local people, she says, and the West Louisville Food Hub will help meet this need. Steven Estes, president of Star Distributed Energy, is excited about the new digester his company is set to build at the West Louisville Food Hub, as well as what it represents. "Sustainable agriculture is tied to renewable energy," he says. Star Distributed Energy has digesters under order in 20 states, says Estes, most of which are in urban settings. "This is agriculture's future—we've got projects all over the country." But Estes is equally excited about the vision for this new food hub in Louisville. "The first step is getting the food hub built," he says. "We want to see Louisville become a leader in this type of endeavor." Heine says it was important that this food hub not be "started from scratch." Therefore, developers looked to other food hubs across the country for example and inspiration. The four food hubs that have most influenced the West Louisville Food Hub include Baltimore Food Hub in Baltimore, Maryland; The Food District in Columbus, Ohio; CCK Pearl, in Dorchester, Massachusetts; and Grow Food Carolina in Charleston, South Carolina. Located in the city's Russell neighborhood, the food hub's land was once owned and operated by National Tobacco Works. The acreage has sat vacant since 2010, when it was sold. The area surrounding the food hub site has a poverty rate of 49.3 percent and an unemployment rate of 34.1 percent, according to U.S. Census data. Heine wants the West Louisville Food Hub to serve the community by becoming a true part of it—therefore, she and others are reaching out to neighbors of the hub so they can be involved. Estes believes that the anaerobic digester planned for the food hub will do more than provide power—it will also provide opportunity. "If we as a country are able to anchor anaerobic digesters to urban food hubs, this would create jobs in urban areas," he says. "Plus there would be more access to fresh fruits and vegetables."